Why pay for television if you can place a digital aerial antenna somewhere in your flat and receive Freeview TV for no subscription cost? Many countries are still offering free terrestrial television using over the air broadcasting. If you live in the United Kingdom (UK) you can also take advantage of this service. In this guide, I will offer resources and websites that can help you make an informed decision. I will also provide recommendations on aerial antennas and set-top box recorders to get you connected to free TV. 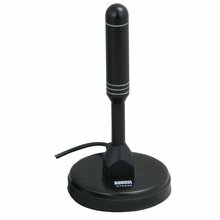 Looking For an HD Antenna in The USA? Click Here for Our How to Guide. How Does Terrestrial Television Work in the UK? The United Kingdoms uses Freeview as it’s platform for digital terrestrial television. Launched in 2002, it is a joint venture between the BBC, ITV, Channel 4, Sky and transmitter operator Arqiva. They currently offer around 60+ standard television channels, 12+ HD channels and 26 digital radio channels. It works like most over the air broadcast services. The stations are broadcasted from digital towers placed throughout the country to deliver the content. They broadcast from more than 1,000 transmitters all over the UK. You will need a TV or set-top box with a Freeview tuner to receive these stations. For HD channels you must have an HD capable tuner. Since 2008 all new televisions sold in the UK are required to have a built-in Freeview tuner. Freeview is in the process of updating its network. This will provide better service and channels in the near future. There are several online resources that can help you choose what size aerial antenna you will need. It all depends on how far you are from the broadcast towers. Here are some good websites and apps that will provide you with where your local broadcast tower is and what channels are available in your area. The site will generate a guide that will help you to choose an aerial. Digital UK – Information, and advice about terrestrial TV channels, services and reception. Freeview – Will tell you what channels you can receive using your postal code. These apps for your phone can help point your aerial antenna. They can be useful and accurate when you are in the attic or on the roof trying to adjust your antenna. Just use one of these apps to point your antenna in the right direction. When you use these websites, you simply type in your postal code and address. You will see a list of broadcast towers in your area. It will also include the distance and bearing they are from your location and the type of aerial group or antenna you will need to receive the channels that are available in your location. You can then use the aerial guide to choose your antenna. Below is an example of what information the sites will provide. This guide will show you which type of antenna you will need in your area. The aerial antennas are placed in groups and color-coded by the number of UHF channels you can receive. In general, group W or wideband aerials maybe the best to accept all channels and any future planned channel expansions. There are many different types of antennas on the market. Depending on your location and aerial group, we have broken down these antennas by distance- meaning how far away you are from the nearest digital transmitting tower. A good rule of thumb is the higher you place your antenna in your flat, the better the reception you will get. With all of these digital aerial antennas make sure to use the re-scan option on your TV from time to time. This will ensure you are receiving the latest channels. The 1byone 0.7 mm Paper Thin HDTV Aerial is small and lightweight. It can be placed in just about any area window. It is quick and easy to set upé. For most applications, it requires no power. They do sell an optional power booster to increase signal reception. If you are in a strong signal area this aerial will work well. This aerial is good for distances around 56 kilometers (35 miles) from the digital transmitters. You can’t go wrong with this basic no frills antenna. The August DTA240 Aerial is another good option if you are limited on space. It has a magnetic base and can be conveniently attached to metal surfaces. It is capable of receiving frequencies of VHF 174-230MHz and UHF 470-860MHz. It will work with Freeview and DAB broadcasting. This device is small, portable and requires no power. The 1Byone Amplified Digital TV Aerial is a nicely designed set-top aerial. This digital aerial has a built-in high gain low noise amplifier which will provide you with great reception. It also comes with a tuning dial that allows you to fine-tune your channel and audio selections. It works with both UHF and VHF frequencies. You can also adjust the extending rods for better reception. Easy to set up and operate. Good quality and well made. The 1byone Rectangle Digital Outdoor/Indoor TV Aerial is a well made aerial that can be used indoors or out. It is made of high-quality UV resistant plastic. It is watertight and will withstand the weather very well. This aerial is great for mounting outdoors on a pole or just sitting upright in the attic. It can be used indoors. It is also great for balconies, just mount it to your railing for great Freeview reception. Comes with a complete easy to apply mounting kit. Have You Check AliExpress For Your Next Aerial Antenna? All of these aerials will work for 100+ Kilometers (65+ Mile) range. These are great for mounting outdoors or in a loft. The Labgear LAB450T Tri Boom Aerial is ideal for fringe reception areas. Easy to assemble. This aerial will maximize signal reception and reduce potential interference from 4G cellular. Comes with a reflector bracket for simpler and quick assembly. Efficient X-dipole design with a secure F-type cable connection. The SLx 27884K4 4G 48 Element Aerial Kit for Digital TV is great high gain aerial for outdoor or loft mounting. It combines excellent performance and an easy to assemble kit for easy mounting. Its high gain design makes it perfect for use in weak signal areas. The 4G filter will remove any interference from a 4G mobile signal. 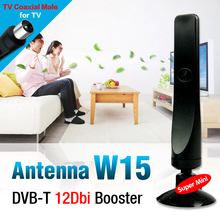 If you have more then one television in your flat you can add a splitter or DA to send that signal to many TV’s. Just plug the aerial into the input of the splitter and the output to your televisions. When adding a splitter to your setup it may require additional cabling to reach your destination. You can also use your aerial in conjunction with a Freeview set-top box. This will allow you to view Freeview channels and record them for later viewing. These set-top boxes can time-shift and pause live TV. They also have an electronic program guide that will show you what is on TV up to 7 days in advance. See Our Article on Combining Your Aerial Antenna With an Android Kodi Streaming Box. Not paying a subscription fee to watch television is a great way to save money. Just by plugging in a digital aerial antenna you can enjoy the benefits of Freeview TV in your area. Just to reiterate, make sure to re-scan your television or set-top box when adjusting your aerial. New channels are also being added to the Freeview service, so re-scanning will ensure you are up to date. I would like to congratulate you for the useful information provided. Just want to say your site is nothing but awesome wish my website was full of the information you have provided. Also, you should do a peace on 4G and 5G interference with TV Aerials across the UK.